AJ has a weird raspberry addiction. Like, we went through 8 cartons in a week timespan. He also loves my planner, which normally he sticks the pen I have attached to in through the rings. Today, however, he decided it was funny to fill it full of these tiny red berries of hell, they are hell becuase he then poked them and made them squishy. Which, if you haven't tried to get smooshed mash out of metal rings, I don't recommend trying it. And.... The "Mom of the Year" award goes to no one other than ME today! 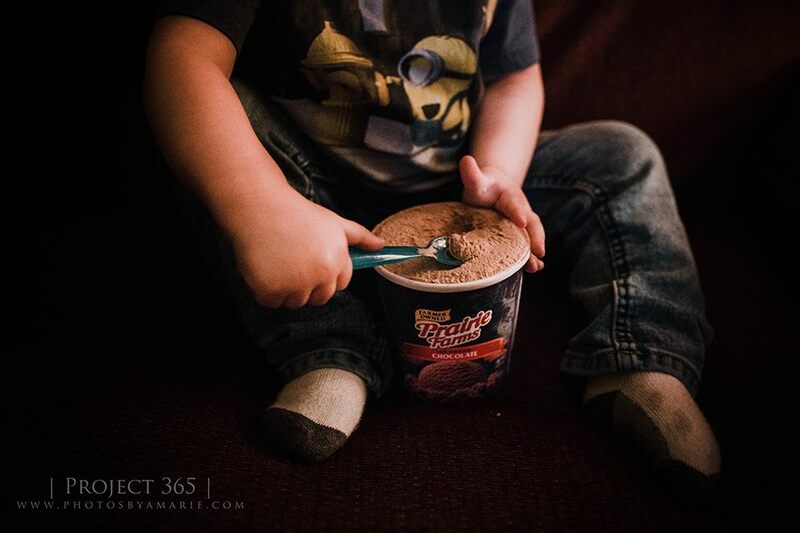 Ice cream for dinner, don't judge, you know you are jealous of it. I bought each of us our own carton last week, becuase I gave up lactose I need my own, and I finally pulled them out. When you are wearing braces and switch your Invisaline retainer, you need something cold to sit on your poor sore teeth. AJ loved his part in my coping process. What do you do when your toddler takes every pillow in the house and piles them on the couch? You make forts of course! Though, they didn't last more than a minute before he caved them in by climbing on it, he did love being inside of his fort for the two minutes it stood before Hurricane AJ destroyed it. And while he was super excited about his bath so he could go outside, he wasn't as thrilled about having to put on clothes to actually walk out the door. 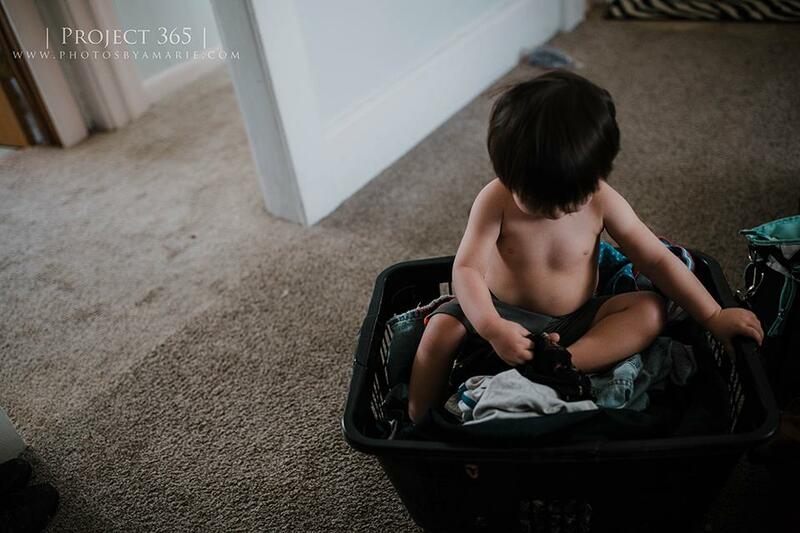 If this child could stay naked all day he would, but the thought scared me becuase I am more concerned about my carpet. Mom! Stop taking my picture!!! 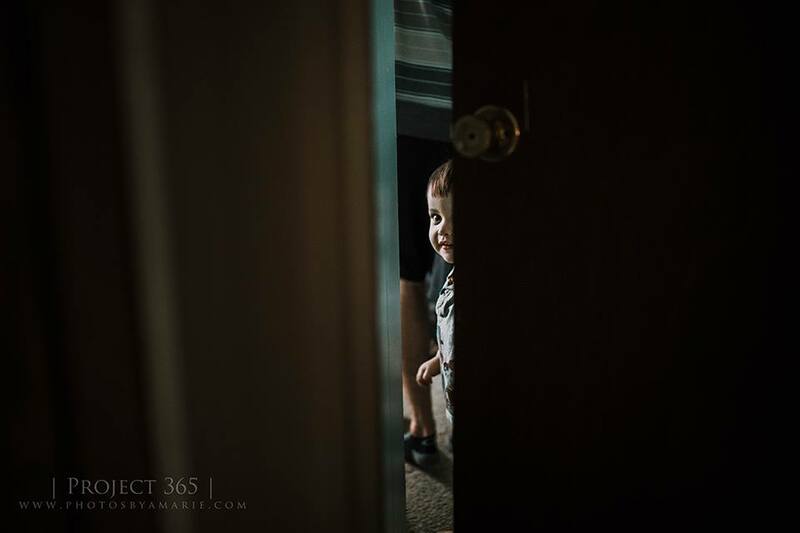 Today was a rough one for documenting, little Mr. AJ was not feeling the camera and insted wanted to hang out in his room with his aunts who were visiting. This meant that before mom went to work, he wanted nothing to do with her. Someone finally loves their bathtime again. When AJ had his cast on, baths were horrible, like down right teeth gritting, want to punch someone in the face, unbearable. I am happy that he is finally back to himself now. It makes our day so much better. Late night movies before bed. Our Sundays are full of cuddles, wrestling, etc. I had a birth that took all day, so I didn't get to go to the park and play with goobie. But, night time cuddles with his daddy and him make it all worth it. This is how I get AJ to relax while he is at work with me, no shame in my game. 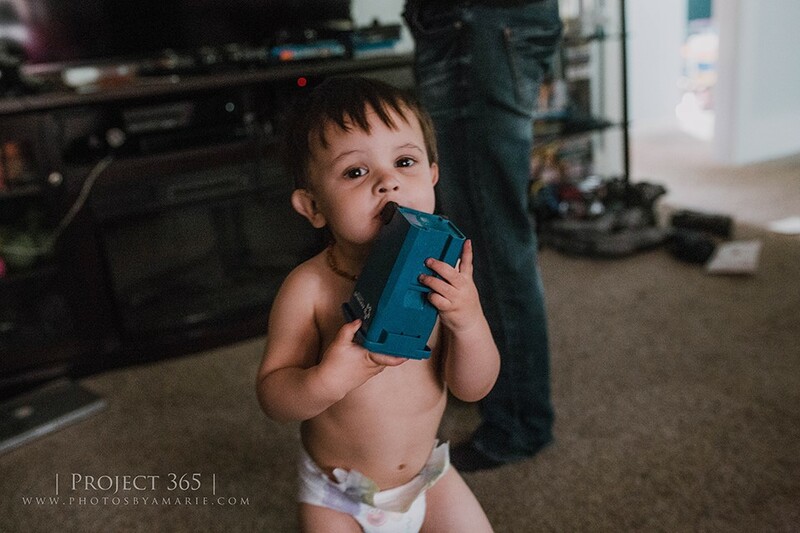 He will watch his movie for a little bit, then go and play with all of his cars and toys in my office, then climb up on the tractors and flirt with the customers that come in. I think it improves the sales honestly, I mean this year has been a good year for work so far haha. Our post office runs. AJ gets to flirt with all of the postal ladies in the building. Today, we said goodbye to his favorite though, becuase she was retiring. He did get a sucker and a sticker from her though, which brightened his mood as he waved goodbye when we walked out. I will admit, I have been horrible at keeping today updated. A last minute photo right before bed explains that my day was hectic. The soft focus, explains my head, and the grittyness explains my day was a mess. It was a Wednesday that felt like a Monday completely. AJ was going to stay the night with his Grammy tonight, but he had to leave something for us to remember him by. I craved flaming hot Cheetos and Funyons my entire pregnancy, so it makes me laugh when he wants to eat them the few times we have them in the house..
We spent the day playing with his Aunt Nay Nay today. Which mainly consisted of hunting down missing eggs, a walk to the park, climbing up the slide a million times, and raking leaves. This boy is an amazing stick picker uper if you ever need one... Just saying! Happy Easter! I swear it came too fast this year as I constantly forgot when it was. AJ got to visit all his family members and colored some eggs with his aunties at grammy's house. He wasn't too fond of sharing them though, it's a work in progress. We travelled everywhere today for work and I finally got to introduce AJ to the wonders of Chick-fil-a nuggets. I used to hate this place when I lived in North Carolina, because it was all we ever had time to grab on our non-existent lunch breaks at the studio. But, after 2 years of not having one hundreds of miles from you, you kind of miss it. We rescued a kitten yesterday from getting hit from cars in the middle of the road. After finding him a happy home, we got to enjoy some cute kitten cuddles and AJ was such a fan of him. He kept saying "mine," to him, which was so cute. When we gave him away at the end of the day, he was a big boy and only cried becuase I wouldn't let him out of the car seat. I was so proud of him. Dad made popcorn for a late night snack. AJ loves his popcorn, even if his father always burns it on the "popcorn" setting on the microwave. Me, not so much, I have to be in the mood for popcorn to actually eat it. After it rained all day, AJ got to play in the puddles. He thought it was the coolest thing ever, which was a good thing we took of his shoes and socks so he didn't destroy them. He ran a half mile home from our walk becuase we told him we would let him play in the puddles in front of our house if he was a good boy. Bribery works wonders lol. After a long day of work, I always look forward to coming home on Friday night to see these two being silly, watching movies together, and making a mess of our house. Tonight, it was movies and popcorn, which AJ now needs to eat everytime he watches a movie, courtesy of his daddy. Yesterday, I had to buy these little bananas for AJ. Only $.99 for the bunch, and he loved them! 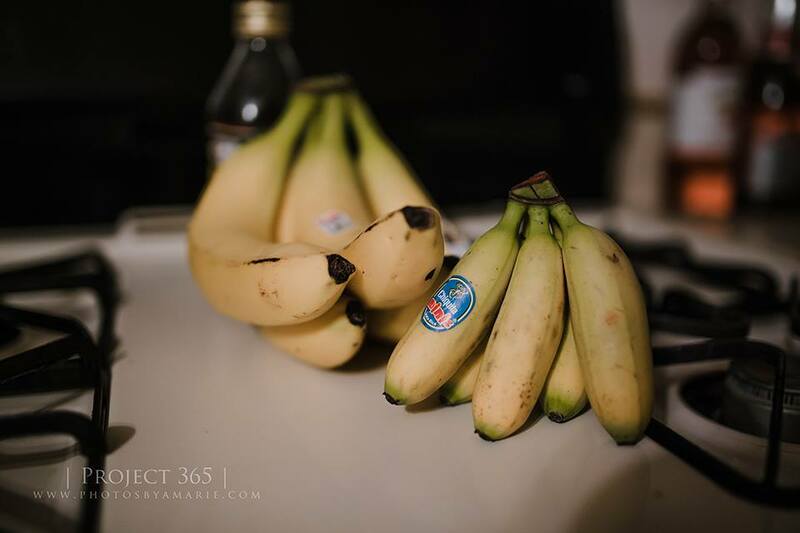 Since they are so small, we didn't have to cut them in half and give him parts of a normal banana. He liked being able to hold his own like daddy, since mommy don't like them lol. He caught me trying to take his photo for todays update. I was hiding behind the couch and he seen me, which then resulted in him climbing up the couch to see what I was doing. Surprising though, he smiled for these. Take your child to work day isn't only one day a year for me. 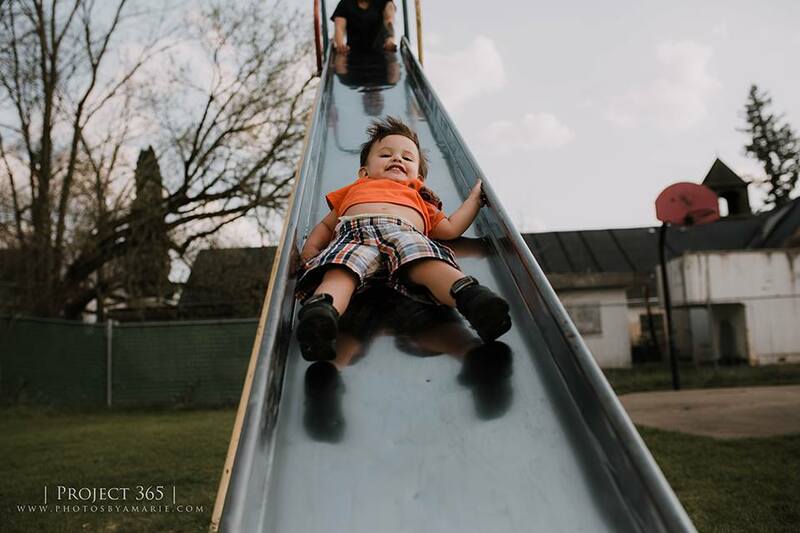 It's two times a week, which can be stressful when I have deadlines for things to get done, but also very rewarding when I get to spend more time with my little instead of making him stay in daycare. When that little face pops over my desk from where he is playing, the biggest smile always appears. I love that little goof. We took our what seems to be daily bank trip today. (It really is daily pretty much, we live in the local bank haha) AJ loves going becuase he gets to pick out which sucker he wants to take home with him. This week he grabbed three, becuase aparently he didn't like his pina colada one he picked out first lol. The garbage company we use at work gave us this itty bitty trash bin when they took over the old company we used. AJ liked playing with it, so I gave it to him. Who knew a trash bin would keep a child so occupied. It's been raining and mucky out and of course this isn't a good combination with a toddler that just wants to be outside all day. I allowed him to go out and get the mail with me and when he had to come back inside, this was the outcome. 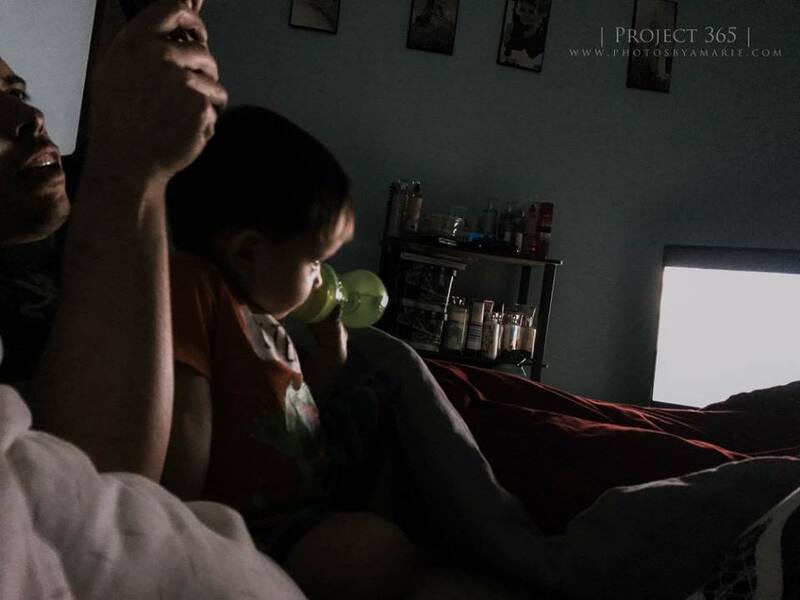 AJ's morning ritual consists of watching Marsha and the Bear, along with a cup of chocolate milk... thanks to his daddy that got him hooked on it. Saturday mornings in our household look like this, with both of the boys wrestling in the living room, tearing apart the couch. 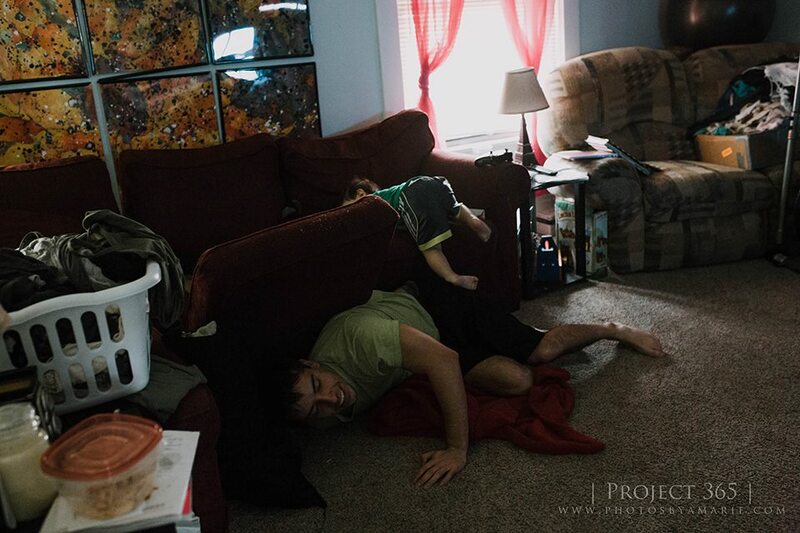 I think Goobie won this round, especially when the cushion ended up on dad's head and a jumping AJ on top. How is it that April is already over? I feel like the month just started and here I am writing the last day's update. Daddy and AJ went to Grammy's for a little bit so I could get some things done, which included some editing and confirming appointments, plus hopefully a few blog posts that I have put off for months. AJ wasn't too thrilled to take a photo today becuase I was interupting his "Mater Tales" time. This kid loves his Cars.